BUYSOUNDTRAX Records presents the original soundtrack to SOMETHING THE LORD MADE. The album features music composed for the 2004 HBO drama written by Peter Silverman and Robert Caswell, directed by television veteran Joseph Sargent and starring Alan Rickman, Mos Def, Kyra Sedgwick, Gabrielle Union, Clayton LeBouef, Charles S. Dutton and Mary Stuart Masterson. Golden Globe-nominated composer Christopher Young has scored nearly 100 films, including films such as HELLRAISER, JENNIFER 8, MURDER IN THE FIRST, COPYCAT, SPECIES, THE HURRICANE, SWORDFISH, THE SHIPPING NEWS, THE HURRICANE, THE CORE, THE GRUDGE, THE EXORCISM OF EMILY ROSE, SPIDER-MAN 3 and, most recently, UNTRACEABLE and SLEEPWALKING. Born in Red Bank, New Jersey, Young graduated from Massachusetts Hampshire College with a BA in music and did post-graduate work at North Texas State University, studying big band writing and classical composition before moving to Los Angeles in 1980. While enrolled at UCLA, he studied with famed film composer David Raksin. In addition to his career as a film composer, he has also taught composition at UCLA. 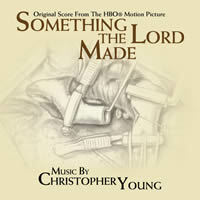 BUYSOUNDTRAX Records is proud to present SOMETHING THE LORD MADE, featuring original score from the HBO motion picture composed by Christopher Young. SOMETHING THE LORD MADE is a limited edition release of 1000 units.